During the building of the transcontinental railroad, the owners of the Union Pacific Railroad Company set themselves up as the owners of a construction company - The Credit Mobilier. They proceeded to award themselves fat contracts, paid for by the U.S. Congress, to construct their own railway. 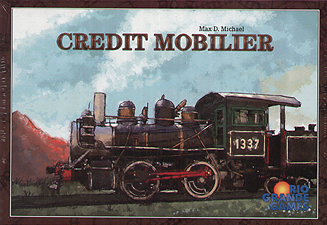 In this game four fictional railways race to construct track and move goods westward while the players invest in the railways and the Credit Mobilier.